Remember the paper dresses of the 1960's? Originally a marketing tool by Scott Paper company in 1966, it sparked a surprising trend that inspired many other manufacturers, including Andy Warhol. The Pratt Institute opened a new exhibit in collaboration with Ralph Pucci this week. 50 design students were tasked to create a textural study to dress female mannequins. 24 pieces were chosen for the exhibit. Judges included fashion designer Anna Sui, Bergdorf Goodman's Linda Fargo, interior designer Vicente Wolf and others. The exhibition will be open to the public on December 8, 9, and 10 from 11 a.m. to 4 p.m. 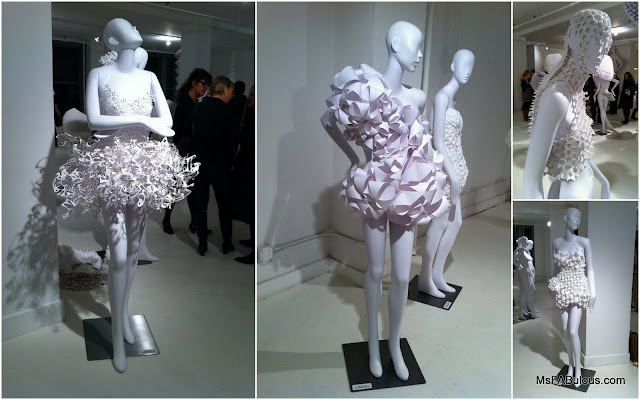 The exhibit takes place at Pucci's Gallery 9 showroom at 44 West 18th Street, on the 9th floor.